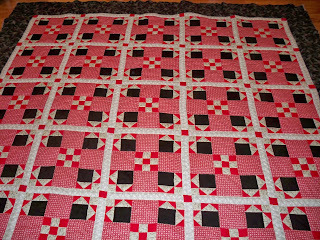 This is a quilt that I made for my son Troy. Out of all the quilts that I have made he did not like them. I had to make sure it had no flowers in the material(which is hard, because I like flowers). did a great job Beverly...love the quilt...and yes, I love flowers too...and David wants a quilt without flowers...how can they do this to us???? I like the colors in this one. It's one of my favorite patterns too.